Aerates continuously. Constantly moves the water to keep it much fresher than a standard water bowl. Contains an ultra-fine charcoal filter that eliminates impurities, hair and dust to ensure that your pet is drinking only clean and fresh water. Your family pets deserve healthy water! Has a 1.8L capacity water suitable for all sizes of dogs and cats.. The water slowly flows from the top and is often called the "Gently Bubble Flowing Water Surface for Perfect Tongue Licking Pets". 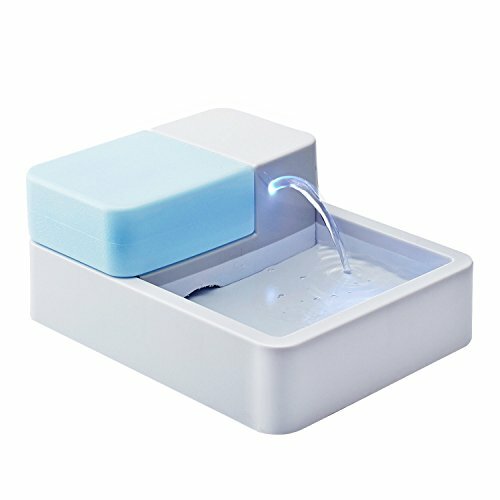 This pet water feeder has blue LED night light for nighttime illumination so your pet can drink easer at night. This pet water fountain is easy to operate. The lower height of this drinking fountain has made it work very well in your home where space is limited. Overview: A smart water fountain type bowl that aerates and circulates the water for your dog or cat. Your pet’s health will be enhanced because of the clean filtered water. This water bowl fountain is a must have pet care item.